When we got this game I wasn’t sure how the boys were going to react. Once they got into it a little bit they really got into it. 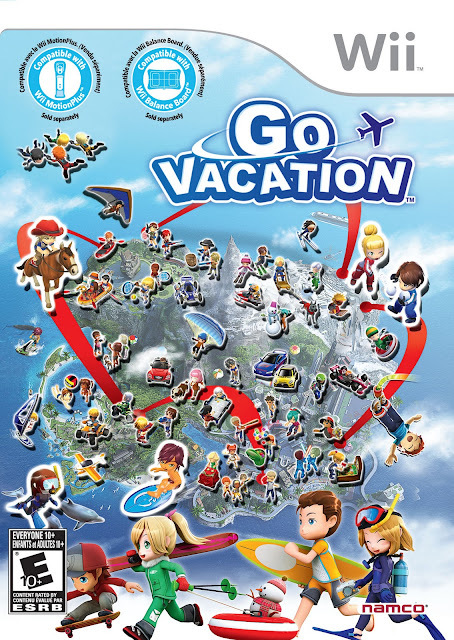 Go Vacation allows you to use a Mii character that you already have on your Wii system. Then you can go off and explore. There is a ‘path’ that you can follow, but the boys seem to really quite enjoy just exploring. There’s fifty different activities in the game. From Swimming and surfing to race car driving and scuba diving. Aiden really likes the game. He likes to explore the landscape and he likes that as he plays the game he can open new areas. He also really likes being able to customize his character in the game. The game itself is pretty good. There’s lots to do and if you’re overwhelmed there are goals that can help you find out what all is in the game. This is a very good casual kind of game. You can jump in and play and leave and come back easily. There is some decent replay value in the game as the second time you play an activity there is more to those activities then the first time you played it. With fifty different activities there is a lot to try and do. You can play two players at once and I believe you can play four players at once as well in some of the activities. The game isn’t perfect, while the computer controlled character(s) who instruct you and show you how and what to dogive you good information, there is a very annoying chirping/beeping noise rather then voice overs. It’s particularly annoying if you’re not playing the game and are in the same room as those playing it. From a players perspective the controls for some of the activities is a little counter intuitive. There seems to be a a way to change it, but for my boys they didn’t figure it out. They often learn new games quickly, and they did with this one too, but they complained about the controls for the ATV and the water bike in the first ‘resort’. All in all, it’s a good game. The boys really like playing it. I’d be willing to buy this game had we not been provided with a copy of it.